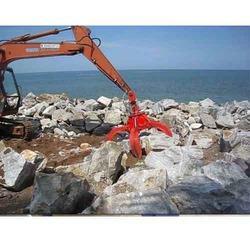 We are highly anticipated as major manufacturers and suppliers of Mechanical Grabs. These grabs are heavily demanded in the market for their high accuracy and sturdiness traits which makes them ideal for use in heavy industries. Designed by skilled experts using advanced technology and finest quality material, these grabs are available with us in varied stipulations. 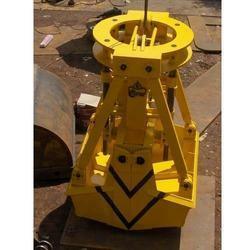 We are well-known organisation instrumental in manufacturing and supplying Hydraulic Orange Peel Grab. Our offered orange peel are highly durable and excellent in finishing owing to their fabrication being done as per latest industrial norms. In addition to this, our offered peel grabs are available with us varied preferences for serving precise needs of customers. Single Rope Mechanical Grabs are widely used in handling Bulk cargo, Lime stone, Slag & Mill scale, B.F.Coke Blast Furnace. Widely known as touchdown open Grab and working on link mechanism operated by single rope through pulley block. The opening of the grab happens on touching down the bottom of the Grab. Moreover, we intend to make the supply of these products to customers in tamper-proof packaging at equitable price tags. Capacity ranges from 0.25 M³ to 2 M³. 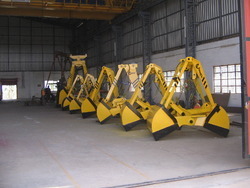 We, Material Handling Grabs are leading manufacturers and suppliers of material handling grabs like scraper grab, dredger grab, single rope grab, multi rope grab. 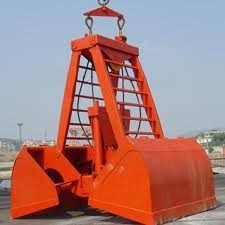 We develop and design Grab Bucket according to the volume of material to be lifted. In the designing, also matters, is its cycle time of delivering the raw material to other line. Widely used in different verticals of industries for the applications and handling bulk raw materials, these can be also offered with EOT cranes. Looking for Mechanical Grabs ?